Utah’s water varies from area to area, just like the weather and views. You always hear about areas that have particularly hard water in Utah, like Riverton, or Herriman, Rosecrest, and others which can have water hardness levels exceeding 35 gpg of Calcium Carbonate hardness on a consistent basis. There is an overall trend in areas like Bountiful, Centerville, Lindon and Pleasant Grove, where there are dramatic fluctuations in the average water hardness and this important to consider when choosing or maintaining a home water system here in our great State of Utah. Orem, Lindon – Hardness levels are increasing, and older softeners are showing strong evidence of hydrocarbon contamination. These oils can easily be removed by a systemic performance enhancing cleaner like ProGuard. If you’re using a private well in this area, be prepared to address iron as well as high hardness levels. Lindon recently had another boil order (Christmas 2016) due to coliform contamination; so whole house Ultraviolet (UV) and point of use Ultrafiltration (UF) are affordable peace of mind. Provo – Seasonal corrosion is beginning to increase again, as evidenced by the increasing levels of dissolved CO2 in the water. As the ambient temperature drops further through winter the dissolved CO2 levels will continue to rise and cause additional complications for home and business users. Pleasant Grove, Manilla, and American Fork – Increasing water hardness levels, especially in areas surrounding the LDS temple towards Cedar Hills, where we are seeing elevated iron levels – even on municipal water. Alpine/Highland – Generally stable, hardness is steady around 18 – 23gpg with traces of iron. Wells along Bull river run show elevated ferrous iron levels. Draper – Hard water with fluctuations in the 10 – 20 gpg range throughout the year. Some older areas still have lingering iron issues. Rosecrest – Extremely hard water, with reports of hardness anywhere from 30 gpg to as high as 48 gpg. Chlorine tastes and odors. High TDS levels contributing to corrosion of water heaters. Sandy – 12-25 gpg total hardness, and low-level iron. Levels fluctuate depending on where in the neighborhood and throughout the year – we’ve seen levels as low as 8gpg and lower total alkalinity than usual (as low as 80 mg/L). Midvale – Midvale was once the home of a soft water well and famous throughout the region. Nowadays, the water averages around 7-10 gpg total hardness. Iron is found at homes and businesses in older parts of town. 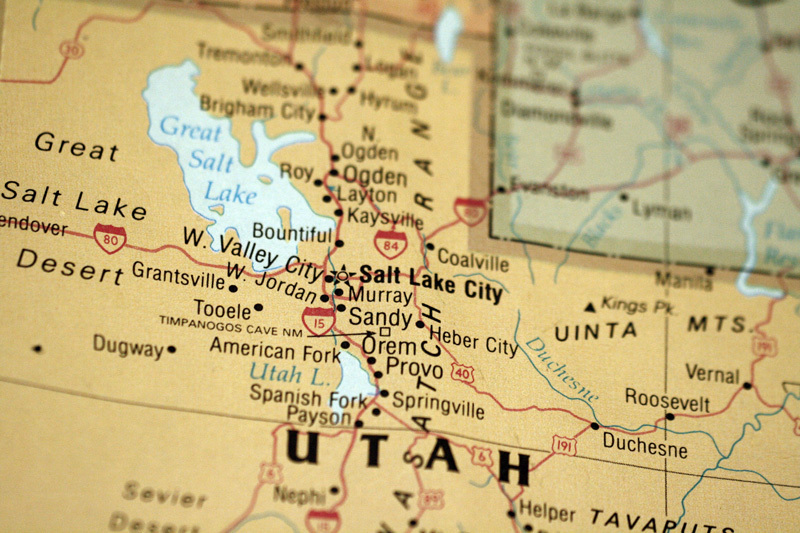 Salt Lake City – Downtown – Older plumbing is yielding ferric iron into the water, benign halophilic bacteria is causing tastes and odors, and of course the hardness varies from 10 – 18 grains per gallon, depending on the time of year. Salt Lake City – Federal Heights to”The Avenues” – All of the new remodel and restoration work in these areas has stirred up particulates from older water main laterals. Watch out for sediment, trace levels of ferrous iron, 15-20 grains per gallon of hardness, and occasional bacterial contamination. Alta – Depending on where you are up the mountain, hardness will vary from 2 gpg to as much as 30 gpg. Watch out for dissolved CO2 causing corrosion problems, especially in Winter. Eagle Mountain and the Ranches – The water supply here continues to fluctuate in quality and availability, hardness fluctuating wildly from month to month, but generally worse at the end of summer, averaging from 18gpg -33gpg. Saratoga Springs – The city supply is stable around 22gpg of hardness, but private wells headed towards Pelican Bay are exhibiting anomalous levels of iron, hardness, manganese, hydrogen sulfide, and even dramatic fluctuations in water temperature. Salt Lake City Downtown – Traditionally, this area averages in the 16-18gpg range. For the first time this year (2015), we have seen summertime spikes at 22-25gpg with increases in alkalinity and conductivity. Mosida – Consistently hard water in excess of 30gpg, with sulfates, silica and high TDS levels creating complications and consternation for many water softener owners. Goshen and Genola – Slight improvement in Iron levels around the south end of Utah lake, but stable hardness levels between 23 – 30gpg depending on the locale. Santaquin, Payson, Spring Lake and West Mountain – Increasing hardness levels, with increasing levels of heavy metals, especially on the west side on I-15. Our average reading here for 2015 has been 25gpg of hardness and 0.5ppm of Iron. Elk Ridge, Woodland Hills, Salem, and surrounding area – Generally stable hardness levels at 15gpg – 25 gpg, increasing towards the east. Staining iron levels are consostently being found in Elk Ridge. Spanish Fork and Benjamin – Hardness levels are increasing again, and iron levels are in excess of 2ppm in many areas, especially around the Hindu temple. Water along South Field road is much worse this year; many homeowners are reporting massive iron problems, hydrogen sulfide, HPC bacteria and increasing hardness levels. Palmyra’s water continues to represent 25gpg hardness and 3ppm iron. Lakeshore water appears to now have a consistent baseline level of arsenic and arsenate. We’ve supplied a number of engineered arsenic removal systems that have been approved by the Utah county health department for use in this area. If you’re on you own private well in the Lakeshore area, test your water now and every year for the presence of arsenic. Arsenic has a cumulative effect in your body and you should avoid any level of arsenic in the water that you drink. Springville, Mapleton and Hobble creek canyon – East-Springville’s corrosive water conditions seem to be declining…someone is doing the right thing at a municipal level. Years of corrosive water have caused numerous problems in this area as evidenced by blue/green staining on bathtubs, sinks, toilets, tile grout and of-course significant water softener degradation and failure due to copper fouling. Crusader Water Systems with AquaPro 500-2, 3, and 4 have been completely unaffected by the elevated copper. The surrounding area continues to show sulfates, ferrous iron, and elevated hardness around 23gpg. Park City/Deer Valley – Heavy metal content is increasing, especially during the summer months. Water in the Wolf Creek area continues to have lowered pH levels, which are a ticking corrosion time-bomb. Heber city and the surrounding area are still showing lowered pH along with troublesomely low levels of Total Alkalinity, especially around Inn-on-the-creek and along Highway 40 towards Jordanelle Reservoir and the Stillwater Lodge area. Promentory – 18-23 grains hard with low alkalinity makes for extreme corrosion risks. Coalville city’s water is constant, but wells up along chalk creek road are showing elevated ferrous iron, HPC’s and iron reducing bacteria. The Red Ledges subdivision has hardness in the 18-20 range and we are receiving more reports of silicate scale issues there. Weber Canyon – Every home from Kamas to the top of this canyon usually has significantly different water. Depending on your own well, you might encounter calcium hardness, hydrocarbons, heavy metals, iron, sulfates, silicates and even nitrates. We recommend a lab analysis once a year if you use water in this area.